Includes new amps and effects plus sidechaining. PRESS RELEASE: Native Instruments today announced Guitar Rig 5 Pro, the next generation of its versatile effects studio. In a further addition to its carefully selected arsenal of authentically modelled guitar amplifiers, Guitar Rig 5 introduces the new Van51 and HotSolo+ models, adding two distinctive flavours of heavily overdriven amplification for intense solos and heavy riffs. The comprehensive collection of effects in Guitar Rig is expanded with six new components - including an additional classic compressor model, the versatile 'vintage verb' with various plate and spring emulations, a compact studio-grade convolution reverb based on the acclaimed Reflektor, an analogue-modelled 8-band filterbank, the new 'stereo tune' chorus, and the unique Resochord harmonizer. Guitar Rig 5 also introduces the ultimate facility for flexible and intricate speaker emulation with its new convolution-based 'Control Room Pro' module. From a comprehensive collection of 27 cabinets and 16 microphones, up to eight cabinets can be combined at a time, each with individual mic placement and room sound controls, enabling an unlimited array of guitar tones for sophisticated studio productions. The new sidechaining function in Guitar Rig 5 opens up the world of advanced studio-level dynamic processing, and also perfectly complements the new range of Guitar Rig-based studio processors such as Vintage Compressors and Solid Mix Series. The sidechain can be assigned to any stereo input of the software, and can be utilized for all compressor modules in Guitar Rig 5 as well as in several of the Modifier modules, allowing for more refined dynamic processing and a wide range of creative techniques. The performance features of Guitar Rig 5 are further enhanced through the new Container, which allows users to easily create, control and recall encapsulated effect chains. With up to sixteen flexible macro controls, it also provides extremely powerful and intuitive real-time tone shaping both for guitarists and electronic live performers. 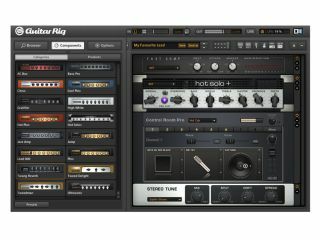 Guitar Rig 5 Pro will be available in September 2011 for $199/179 EUR, and will also be included in the new Komplete 8 and Komplete 8 Ultimate bundles. Information taken from official press release, for more visit Native Instruments.